There’s something appropriate about our kiteboarding instructor’s nickname being Goose. It’s more than a mere facial resemblance – his beady eyes and broom moustache certainly recall Maverick’s dapper but ultimately doomed wingman in Top Gun, but it’s the tongue-in-cheek way he runs his watersports centre like a military boot camp that seals the deal. Within moments of arriving at the wicker beach huts constituting Mark Warner’s oceanside office at the Red Sea resort of Abu Soma, Goose is barking orders into his walkie talkie and hurling waterproof bags of equipment to the boys and girls under his command – perma-tanned youths with the buffness and lazy bravado of Shipwrecked contestants, some arriving with skateboards under their arms despite the sprawling desert on all sides. 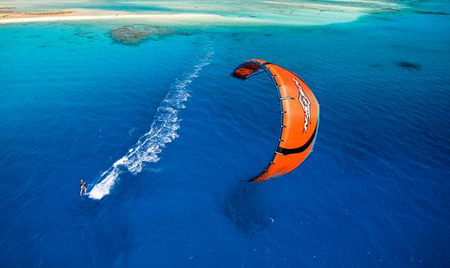 They, in turn, guide us through the process of preparing kites like the ones we can already see soaring over the horizon, colourful canopies effortlessly carrying their board-bound riders at disconcerting speeds over the turquoise surface of the sea. The grace of the display belies the exhausting effort of pre-emptively rigging a kite, especially for a green-gilled first timer like myself. I’m paired up with an optimistic American auditor called David and given the task of inflating the struts of its 16-metre wingspan – the thing flapping and snarling like a wounded pterodactyl the whole time – while he walks the 20m lines along the beach and checks for frays and tangles. It’s then carefully wound and wrapped into a single bag for a fuss-free water launch, a process that takes seasoned boarders less than ten minutes, but which David and I manage to draw out into almost an hour. “Lock and load,” shouts Goose, and his platoon begins stacking kites, boards and bags filled with sandwiches and sun cream into the outboard motor dinghy bobbing in the harbour. The rest of us form a single file by the water’s edge, resisting the urge to salute as Goose walks down the line handing out helmets, safety leashes and lifejackets; moments later we’re seated on the boat and skipping over the ocean, conversation killed by the roar of the engine as the hotel retreats behind us, the wind-whipped palm trees of its private beach appearing to wave goodbye as if for the last time. If we were wearing crucifixes, we’d be kissing them. We speed through the windsurf area first, carefully crossing the paths of sails that zip across the water like upright insect wings, the sea deepening beneath us but still bright and clear enough to make out clusters of rock and coral, and occasional fleeting schools of colourful fish. From here we enter kiteboarding territory, our mouths hanging open in a mix of awe and horror at how aggressively the riders seem to be dragged around by their canopies, occasionally launching into aerial spins and flips so high that I keep thinking they’re going to get sucked into the sky like the guy on YouTube who gets caught in an air pocket (something I really shouldn’t have seen before my first lesson). Our driver kills the engine as we approach the pontoon, passengers disembarking in water no more than waist deep and bordering on bath temperature despite it being late November. “We call this the Oakley Graveyard,” says Goose as he walks the lines of the first kite backwards from the pontoon, “because of how many pairs of sunglasses end up lost at the bottom of the sea.” With the rush of what sounds like a plane taking off the first kite swings into the air – all 12 metres of its bright green awning rippling high overhead as though it were the most natural thing on earth. Which it is, I suppose – although looking down I can’t help feeling there’s something less than natural about the elaborate harness that is about to connect me to it, or the twin-tipped fibreglass boards being unpacked on the pontoon. Ah yes, Carrie. How simple it had all seemed back on that first afternoon in Abu Soma, when I’d stood on desert’s edge and been taught the basics of kite handling, the sun setting behind the crimson Sinai mountains and lending the scene the air of a flashback long before it actually was one. Carrie had explained to me the three dimensional wind window and how the kite operates within it – sitting naturally at 12 o’clock (directly overhead) and picking up speed as it swoops back up from nine or three o’clock (ground level on the port or starboard sides respectively). She showed me how to manipulate the lines for launching and landing, how to swing the kite through figures of eight to maintain a constant speed, and how to bring myself from a seated to a standing position with one mighty swoop across the window – something that left me scrambling over the sand before collapsing to my knees, the kite crashing to earth with a thud. How we laughed. Afterwards we’d seated ourselves at the café and gone through the British Kite Surfing Association (BKSA) guidelines – a long-winded legal requirement outlining the laws of both man (starboard has right of way over port) and nature (warm and cold fronts, high and low pressures, how and why the wind works). All of which seemed to imply that messing around with kites in the middle of the ocean was a dangerous pursuit, and one that shouldn’t be undertaken without a real understanding of the risks involved. 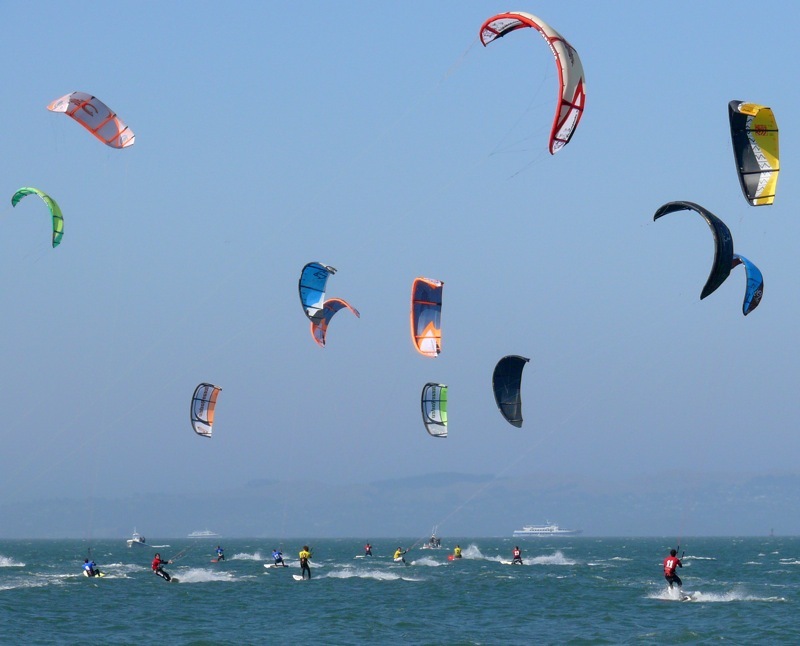 As a result, there’s a certain amount of friction between kiteboarders and windsurfers, who keep to their own area in Abu Soma and tend to view the likes of Goose and Carrie with the same snorting disdain that skiers once reserved for snowboarders. 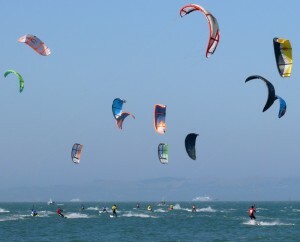 And while the prohibitive cost of kiteboarding may stop it from developing quite as comprehensive a following as regular wave surfing (new kites cost from £500 to well over £1000, boards from £250-£550), it has many of the same attributes – the saltwater dreadlocks, the soul brother lingo and the swelling litany of aerial tricks and rotations. And this is the main bone of contention: true, most accidents involve lines rather than kites themselves, and happen on land rather than in the water, but the tendency among kiteboarders to hurl themselves recklessly into the air (occasionally crashing into buildings, landing on other people or, in the case of that poor chap on YouTube, almost disappearing altogether) has the ability to makes them, and their sport, look very dangerous indeed. All of which weighs heavily on my mind as I lower myself into a seated position in the water, one hand on the bar to keep the kite at 12 o’clock as the other fumbles with the board. Feet finally secure in the straps, I look back at the kite and find myself blinking away sunlight – Oakley Graveyard or not, a pair of sunglasses wouldn’t go amiss at this point. I listen for the wind whistling in both ears, a good sign that I’m facing directly downwind, and point my leading foot slightly forward. I take a deep breath before bringing the kite down to around ten o’clock, and then, with a pull on the starboard side of the bar, swing it brazenly across the wind window to two. Goose’s shouts of encouragement are now competing against the roar of the kite and the high pitched rush of water peeling away from my board as it jolts suddenly to life, lines tightening and lifting me to my feet, my shadow rippling over the surface of the sea as I speed away from the pontoon. The rush of freedom is ten times more powerful than I’d ever imagined it would be: I’m up and kiteboarding on my first attempt. Alright, so it’s not my first attempt. Between Goose first hooking that kite to my harness and me finally standing and soaring away from the group lies an entire morning spent learning the less-than-subtle art of body dragging (allowing the kite to tow a person bodily across the surface of the sea, essential in escaping deep water or retrieving lost boards). Even after I’m allowed to strap a board to my feet there are still hours of false hopes and miserable failures, of lines becoming tangled and kites crashing into the ocean. But that moment, when it comes, is one of unmitigated glory – a moment that, in a final tribute to Top Gun, really does take my breath away.